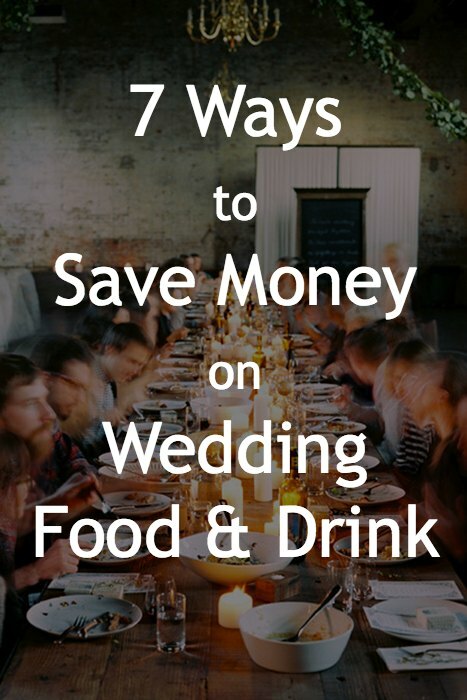 7 Creative Ways To Save On Your Wedding Food & Drink! If you love good food, sacrificing on your wedding meal is something you probably don’t want to consider. 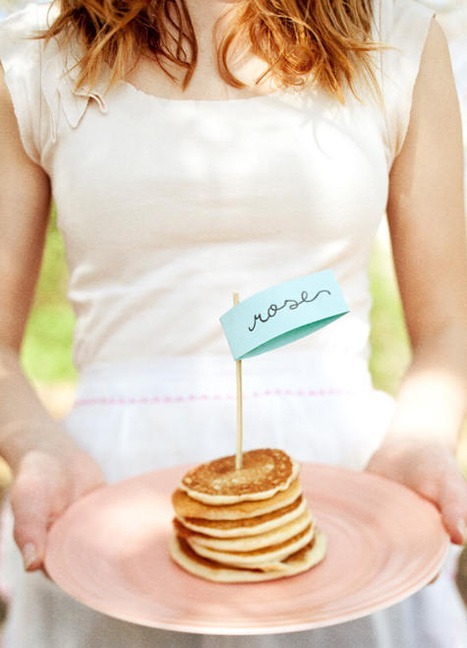 But what if you can cut costs and save money on wedding food, WITHOUT skimping on the quantity, or the quality? Yeaaaaah – we thought you’d be interested! 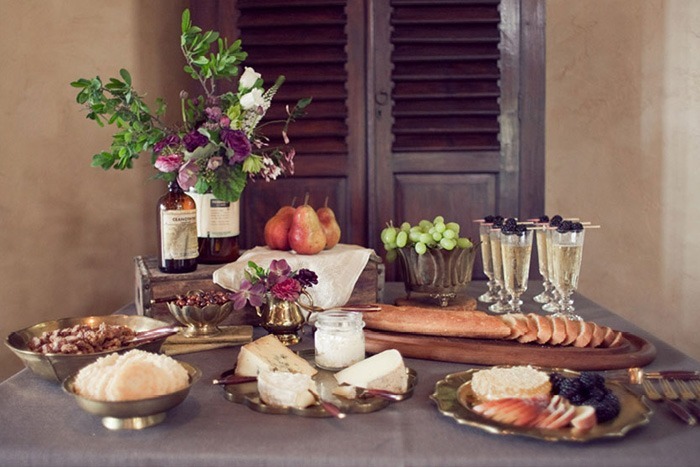 Before reading any further, the number one step to amazing wedding food on a budget is in selecting a wedding venue that will allow you flexibility when planning your wedding dinner, cocktails, appetizers and alcohol needs. If your venue has minimum purchase amounts for alcohol, table settings or a locked in caterer, there will only be so much wiggle room when it comes to saving money on food and drink at your wedding. So choose a beautiful venue that also gives you the freedom to plan around a budget. Since the key to saving money is creativity, start by throwing away all the old notions you have about what a wedding reception should look like, andfind an Okanagan wedding venue that will accommodate your needs. Once you’ve got that figured out, here are seven ways to eat, drink and get married – while fitting within your budget. The buffet’s classier and tastier cousin, family style is by far my favourite money saving option. 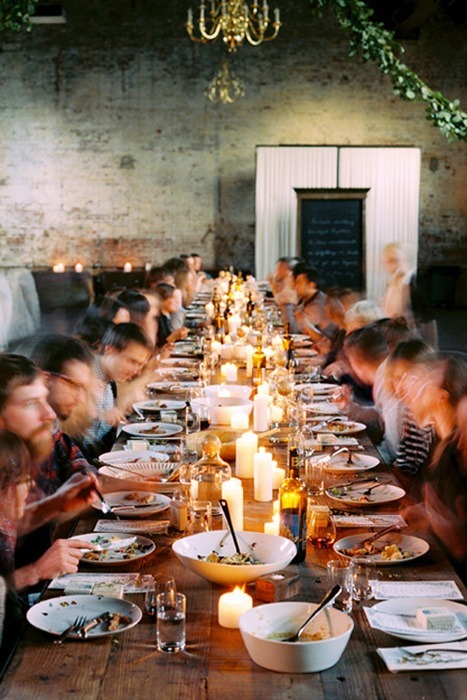 Not only can you save money by serving food this way, but the interactive nature of family style eating will also encourage a wonderfully intimate atmosphere amongst your guests. Rustic and hearty dishes as well as classic comfort foods work best for this type of service, making it a perfect option for a fall or winter wedding. Pros: Passing and sharing food helps guests connect and start conversations. Cons: Not all catering companies will offer this option. The average cost of a sit-down meal at a wedding can run you $100 (or easily more) per person; so for those couples on a really tight budget, it might be best to scrap the meal altogether, especially if you’re looking at using a venue with on-site catering. A cocktail is a great alternative to consider because it will allow you to still serve your guests really fabulous food, but at a fraction of the cost. Some added bonuses: Guests will typically drink less at a cocktail reception, you won’t have to shell out as much for rentals, and if you hold the reception in the afternoon you’ll save money on the venue. Win, win, win! Pros: Great option for foodies on a tiny budget. Cons: Not ideal if you plan on having an evening reception. Pancakes, mimosas, BACON! 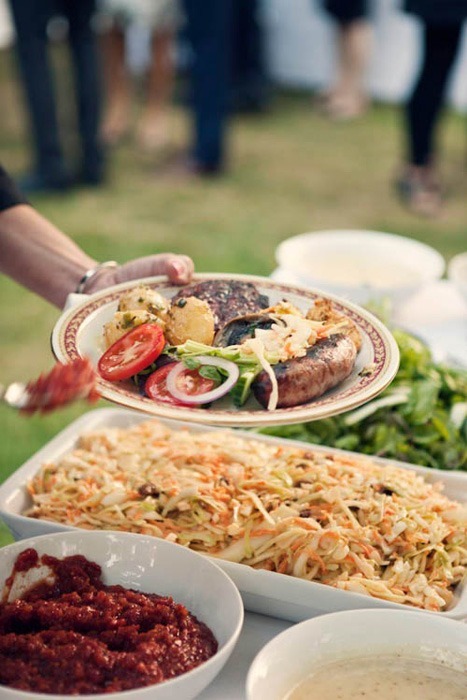 Save money on wedding food – check. Do I really need to explain why this is such a great idea? Cons: Requires you and your guests to be early risers. I don’t know about you, but as a wedding guest I would opt for a juicy burger and grilled corn over a dry piece of chicken and mushy vegetables any day. If you’re having a casual or outdoor wedding, you have a ton of budget-friendly options open to you. Why not have a picnic, a pig roast, or even a potluck? And just because these options are casual and budget friendly, doesn’t mean you can’t find ways to make them gourmet; all you need is a little culinary creativity. You can save more money by doing it yourself, but if that’s more than you want to take on, there are lots of catering companies that offer these kinds of services and will do it for you. 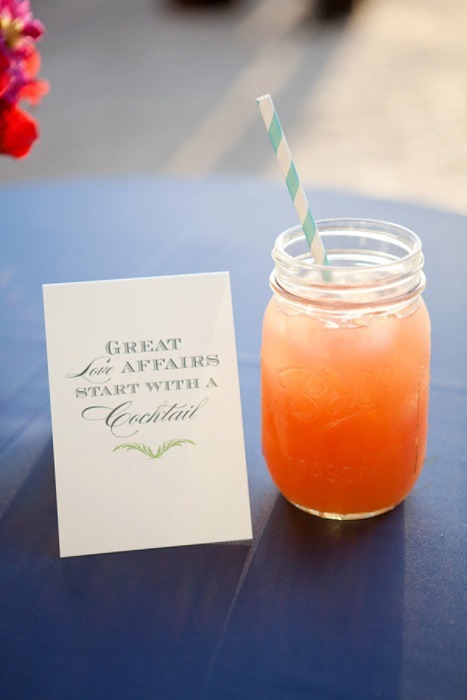 If the idea of an entirely cash bar makes you uncomfortable, but having an open bar isn’t financially feasible, having a signature cocktail passed around to guests during the cocktail hour is a nice way to find a happy medium—guests will appreciate the gesture, you’ll be able to stick to your booze budget, and you’ll be so very on trend. A similar option to save money on wedding food and drink includes placing a couple of bottles of wine on each table for dinner and having a cash bar for the reception. 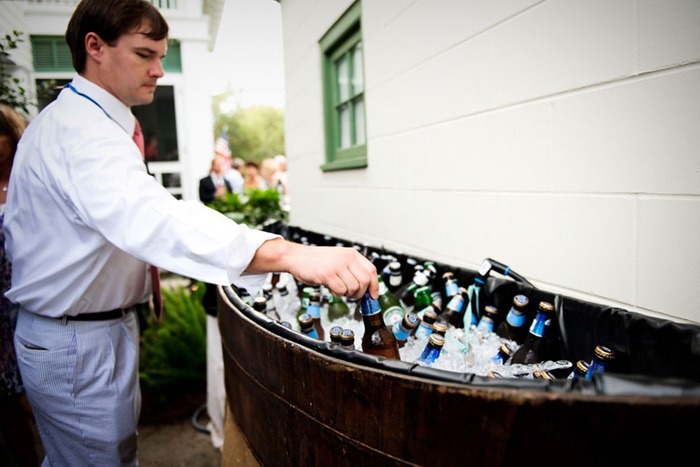 If having an open bar is an absolute must for you, consider limiting the options you offer. Eliminating mixed drinks from the bar can substantially lessen your bar tab because not only are they expensive, but people tend to drink them faster and therefore drink more than they would with just beer or wine. If you have this option open to you, it’s a no-brainer really. It’s requires more work on your part, but you’ll save a ton of money by not having to pay the mark-up costs. To further save money, you can buy your booze in bulk. For example, buy a keg of beer instead of cans or buy a box of wine instead of bottles. 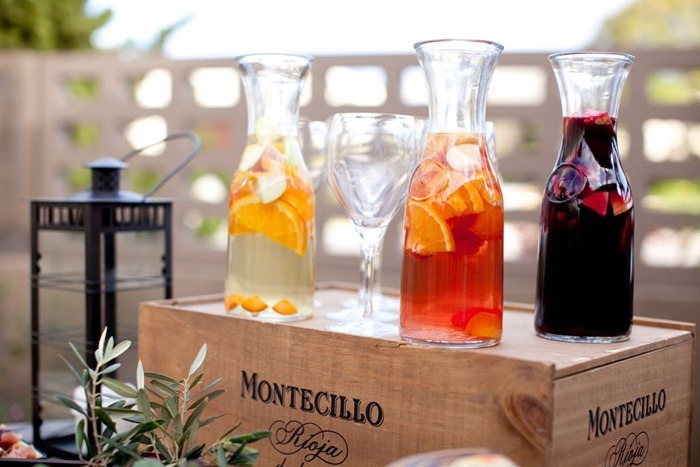 Since a box of wine isn’t the classiest thing out there, just pour the wine into carafes for serving. Some places will even allow you to return any unopened bottles back to the store for a refund. We hope these 7 strategies for awesome wedding food on a budget have been helpful and inspiring! Hopefully at least a couple have ideas that will help you save money on your wedding catering, cocktails and dinner WITHOUT sacrificing on the quality of your food or your celebration.